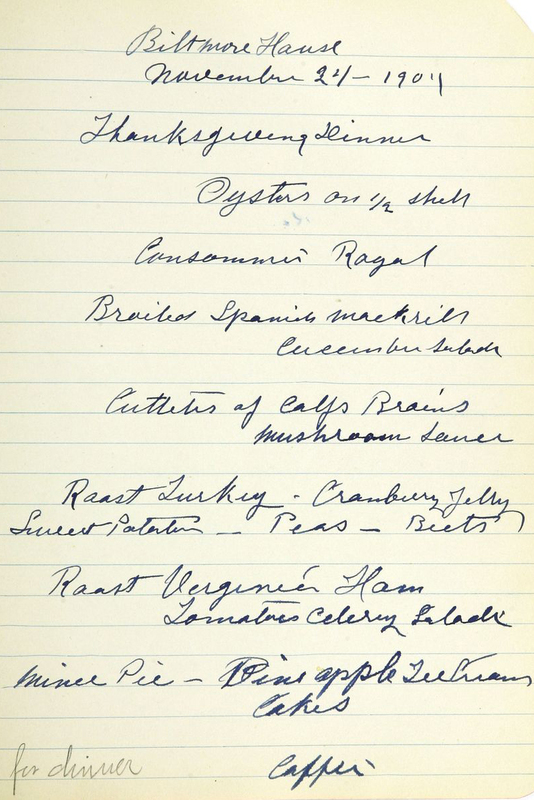 We asked Biltmore Chef Spencer Hilgeman to create recipes inspired from the archival 1904 menu book for a modern Thanksgiving celebration. This second video on our three-part series details a roast turkey entree inspired by the very same menu the Vanderbilts enjoyed at their 1904 Thanksgiving Dinner. Chef suggests using an 8–10# Airline Turkey Breast. 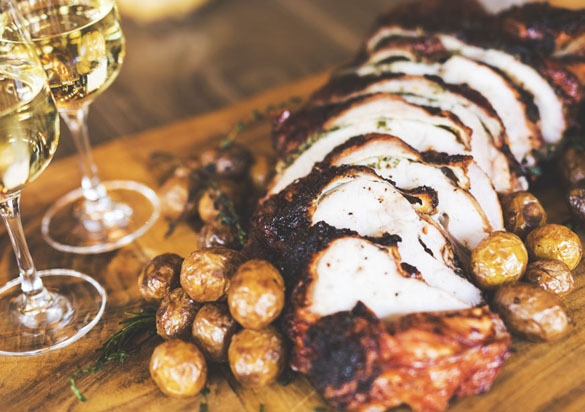 This recipe also would work with a 10–15# Whole Young Turkey. Combine all ingredients and mix. Separate the skin from the breast and stuff the compound butter underneath. Top turkey with 2 TBSP salt, 2 TSBP pepper and 3 TBSP olive oil. Roast uncovered at 375 degrees for 1 ½–2 hours or until the internal temperatures reaches 165 degrees. Combine all ingredients, ensuring the oil coats everything. Place on small baking sheet and bake for 30–45 minutes at 350 degrees, or until potatoes are tender. Bring to a boil, then reduce to a simmer until a light syrup consistency. Allow turkey to rest before applying blood orange glaze. 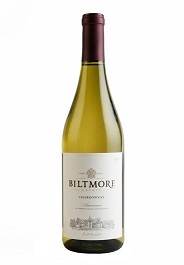 Enjoy with Biltmore Estate Chardonnay. Smooth and balanced with subtle floral aromas, crisp fruit flavors, and hints of oak. Complete your meal with recipes and video instructions for our appetizer, Oysters on the 1/2 Shell with a Holiday Sauce Trio, and for dessert, Apple and Currant Mince Pie with White Cheddar Crust. What other kinds of red wine would work if I wanted to try this for Thanksgiving? May not have time to get the Biltmore red.